GOALS either side of half-time settled this final tie, which had plenty of cut and thrust for the 200 plus crowd bathing in brilliant sunshine. Victory through the goals by Scott Davidson and man of the match Paul Moorhouse handed Thornhill Briggs the league and cup double. While the SP Travel Division Two runners-up tended to play the route one speculative ball, Thornhill Briggs were trying to play football on a surface affected by a marathon run of matches for Brighouse Town's two teams, Blakebroughs, Halifax Town's Academy team and other matches in what has been a long season. The action was lively in the opening minutes with both sides striving for supremacy. 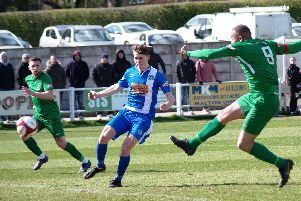 The nearest to a goal came on 11 minutes when John Trickett and impressive youngster Joseph Shaw gave veteran striker Davidson a shooting chance. Triangle thwarted several Thornhill Briggs' forays with last ditch tackles, Simon Mitchell, Michael Robson and Simon Noble making sure there was no one-on-one or a clear shot for keeper David Emmott to save. In the 14th minute Briggs's anchor at the back, Bobby Davidson, put Shaw away and he laid the perfect ball on for Moorhouse but a leg just got in the way of what looked a goalbound shot. Prolific Briggs' scorer Carl Joseph then went near then, from the resultant corner, Emmott prevented Moorhouse from opening his, and his club's account. Chris Green, who was picking up many of the floated Triangle balls aimed for front runners Adam Fenton and Adam Bedford, took himself forward into the opposing half and his rasping shot tested Emmott who plucked the ball superbly out of the air. Moorhouse then let fly at goal and Emmott again got down to this one at the left hand side of his goal. Triangle composed, progressed and hit back at Briggs with a couple of attacks, the best of which featured player-secretary David Whiteley, Noel McGirk and the hard working Bedford. Briggs had the ball in the net in the 28th minute via Scott Davidson but the score was ruled out by competent referee Lionel Pullen for a foul on the keeper. This followed further good work by Trickett and then three minutes later Scott Davidson gave Moorhouse a chance but he headed wide. Paul Singlton just managed to clear for Triangle as lively Briggs' striker Carl Joseph hit one on target. The all important first goal eventually came for Briggs in the 38th minute when Shaw swung in a super corner from the left For Davidson, who has terrorised local defences for years, who headed home. Keeper Emmott claimed a push but his protests were waved away. Moorhouse closed the half with a thunderous free kick from 30 metres out which just drifted to the right of Emmott's goal. Bedford had an early second half chance to level matters for Triangle but was just off target, while Moorhouse, easily Briggs' most accomplished player, was quick to reply. Shaw, who was a tricky customer out on the left, was just off target before Bobby Davidson set him up for another run down his flank. He sent in an inch perfect cross for Moorhouse to hit goal number two with 55 minutes on the clock. Five minutes later Triangle's Stuart Proctor had the ball in the net but Mr Pullen judged there had been interference with Briggs' keeper Malcolm Oranne trying to collect the ball in his area. After some whirlwind substitutions, the best one of which saw Paul Kroll come on for a tiring Shaw, there was plenty of action down in the Triangle half. Both Kroll and then Joseph, following a mazy run, had shots on goal. In the 81st minute Singleton became the first booking of the match, more out of frustration than anger, and Briggs then just, apart from allowing one late entry in their box, wound down the clock with Owen Thomas, Green, Bobby Davidson and Trickett bossing the show. A good proportion of the crowd stayed behind for the presentations, which saw Echo editor Stephen Firth present the cup and plaques and then Simon Cunnah, proprietor of SP Travel, the league's sponsors, presented the Division One championship to Thornhill Briggs.